The first clear detection of X-rays from the giant, gaseous planet Saturn has been made with NASA's Chandra X-ray Observatory. Chandra's image shows that the X-rays are concentrated near Saturn's equator, a surprising result since Jupiter's X-ray emission is mainly concentrated near the poles. 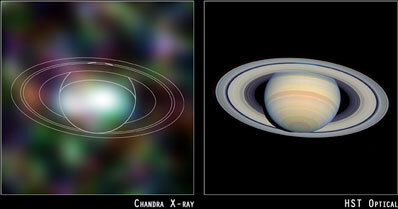 Existing theories cannot easily explain the intensity or distribution of Saturn's X-rays. Chandra observed Saturn for about 20 hours in April of 2003. The spectrum, or distribution with energy of the X-rays, was found to be very similar to that of X-rays from the Sun. "This indicates that Saturn's X-ray emission is due to the scattering of solar X-rays by Saturn's atmosphere," said Jan-Uwe Ness, of the University of Hamburg in Germany and lead author of a paper discussing the Saturn results in an upcoming issue of Astronomy & Astrophysics. "It's a puzzle, since the intensity of Saturn's X-rays requires that Saturn reflects X-rays fifty times more efficiently than the Moon." The observed 90 megawatts of X-ray power from Saturn's equatorial region is roughly consistent with previous observations of the X-radiation from Jupiter's equatorial region. This suggests that both giant, gaseous planets reflect solar X-rays at unexpectedly high rates. Further observations of Jupiter will be needed to test this possibility. "Another interesting result of the observation is that Saturn's rings were not detected in X-rays," noted Scott Wolk of the Harvard-Smithsonian Center for Astrophysics in Cambridge, MA, a coauthor of the paper. "This requires Saturn's rings to be less efficient at scattering X-rays than the planet itself." The same team detected X-radiation from Saturn using the European Space Agency's XMM-Newton Observatory. 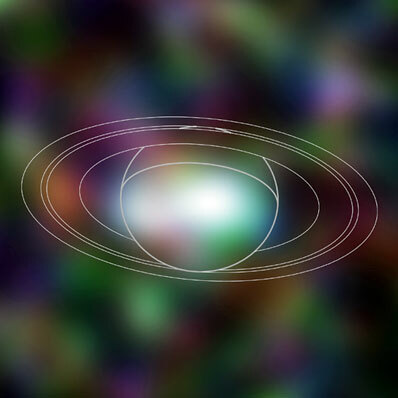 Although these observations could not locate the X-rays on Saturn's disk, the intensity of the observed X-rays was very similar to what was found with Chandra and consistent with a marginal detection of X-rays from Saturn reported in 2000 using the German Roentgensatellite ( ROSAT). The research team, which used Chandra's ACIS instrument to observed Saturn, also included J. Schmitt (Univ. of Hamburg) as well as Konrad Dennerl and Vadim Burwitz (Max Planck Institute, Garching Germany). NASA's Marshall Space Flight Center, Huntsville, Ala., manages the Chandra program for NASA's Office of Space Science, Washington. Northrop Grumman of Redondo Beach, Calif., formerly TRW, Inc., was the prime development contractor for the observatory. The Smithsonian Astrophysical Observatory controls science and flight operations from the Chandra X-ray Center in Cambridge, Mass.